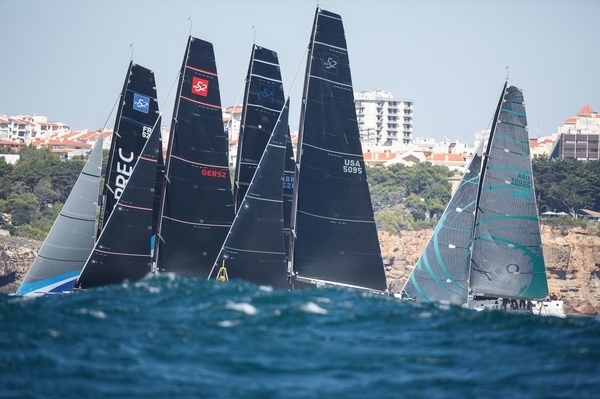 Two beautifully composed, accomplished race wins in strong breezes and big waves today off Cascais highlighted once again why Azzurra are 2015’s champions elect for the 52 Super Series title. Their double bullet, dream day, as they count down to their season’s title winning line, also gives them an overall lead of five points over Quantum Racing in the regatta standings for the Cascais Cup. The perfect double in on for the Roemmers family team winning the circuit and winning the fifth and final regatta of the season. 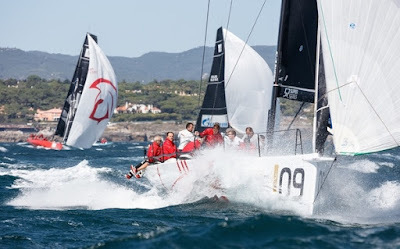 If they can it would be their third regatta win, after Sardinia and Puerto Portals. 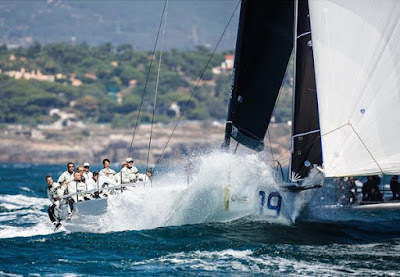 Azzurra proved how comfortable they are in the big breezes when they clinched Settimana delle Boche regatta title in Sardinia on a day when the wind scale rose to 30kts before racing was canned. There, on their home waters, they were in a class of their own. 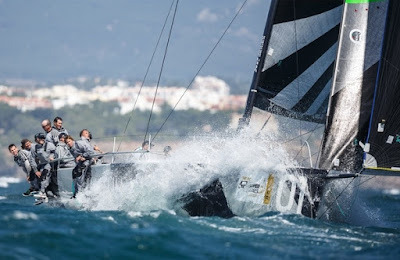 And so it pretty much was again today, tactician Vasco Vascotto confirming they saw 28 knots in the gusty NW’ly breeze today. Quantum Racing had their own double win on Thursday. But they could only reinforce that today with a hard won fourth – which came after a start line penalty left them languishing in the dark depths of the pack on the first beat – and then a sixth. Their choice of the early right from the start line was not as profitable as previously. The breeze proved stronger offshore, a fact identified by the super confident, on form Vasco Vascotto, and Quantum Racing were on the back foot early on in what proved a very tightly compacted first beat. And there is just no let up in the utterly compelling battle for third step on the 52 Super Series podium. Platoon substantially enhanced their claim today with a pair of solid, well deserved third places today. 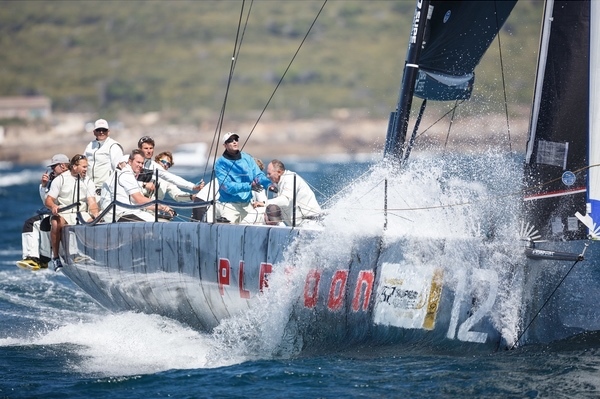 Ergin Imre’s Provezza crew took six points for the day with a 4,2. But fortunes were not so rosy for Sled – who broke their outhaul on the start line of the first race and could only struggle to 11th place – and for third place rivals Bronenosec which exploded a spinnaker – at least their third, if not their fourth of the season – on the first run of Race 5. 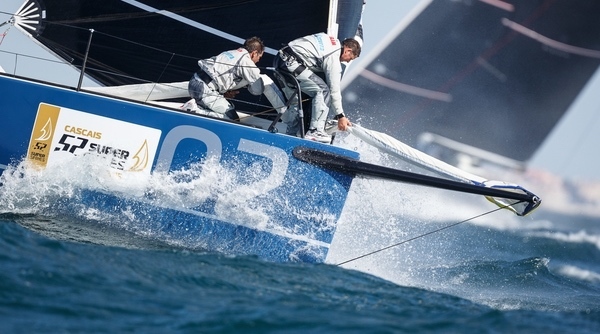 Provezza started well in the first race and got to the right side early, ahead of Azzurra. 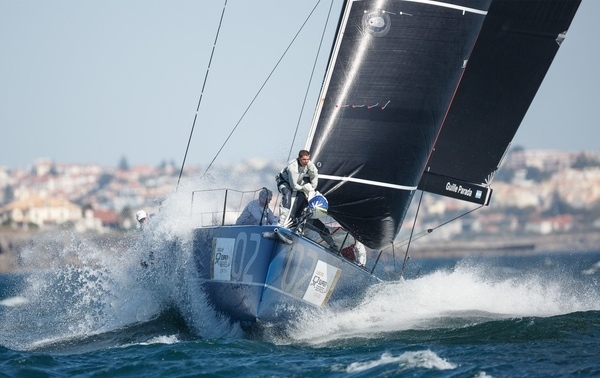 But Azzurra found substantially more breeze down the first run, erring to the left closer to the shore and were ahead by the leeward gate. Despite a last second kite glitch they still pipped Platoon to second on the line while Azzurra crossed the line a long way ahead. The race area was moved slightly for the second race of the day. 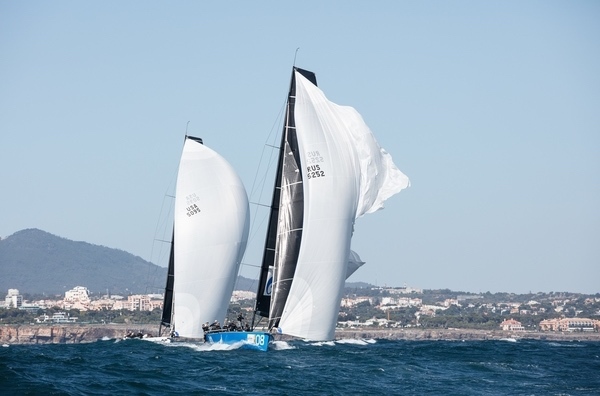 With some bias on the pin end of the line Azzurra were happy to push for this early gain which very quickly allowed them control of the fleet. Andy Soriano’s Alegre worked hard for a good second place, accelerating their climb up the leaderboard after a nightmare opening of 12,10,11. They showed their true mettle today with a 5,2 to lie sixth overall. 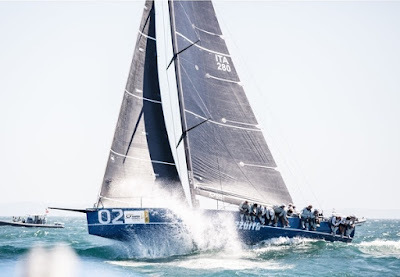 Patience may not always be perceived as one of the virtues most readily associated with Azzurra’s tactician Vasco Vascotto but he claims he does not mind exactly when their title is sealed, be it tomorrow Saturday or Sunday, as long as it comes…. Today, might prove to be the breeziest day of the Cascais Cup. As is often the case the stronger winds and big waves exposed any late season weaknesses. 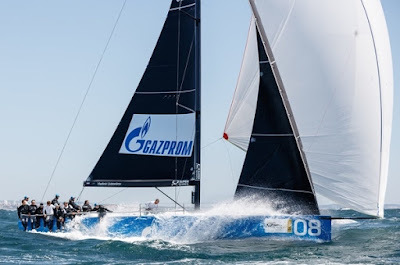 Spookie, leaders after the first day, are reported to have torn two mainsails and the mechanical breakdowns for Sled and Bronenosec may yet prove pivotal. 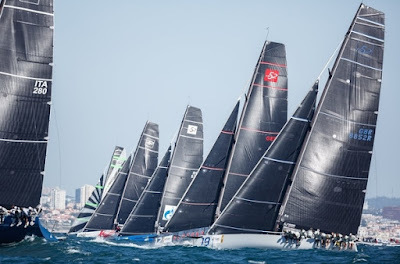 And so the last two days of the 52 Super Series 2015 look set to deliver a completely engaging range of human emotions, from ecstasy to deep frustration. But for sure when the season hits the buffers Sunday afternoon there will be no doubts that this has been a great year for the TP52 Class.